The USITC report, The Economic Impact of U.S. Sanctions with Respect to Cuba, uses the gravity model as the basis for its estimates of the impact of lifting U.S. sanctions on Cuba. I will focus my comments on the study’s use of this model. Let me say at the outset that, while I think that there are some problems with the gravity model as implemented here, I do believe that the conclusions of the report are probably quite believable. That is, U.S. sanctions have some impact, but not all that much. If Cuba wants to trade, it can trade (albeit not with the U.S.). Cuba chooses to limit trade. I should also point out that the gravity model is very standard in this context. Eichengreen and Irwin (1998) call it the “workhorse of empirical studies of (regional integration) to the virtual exclusion of other approaches.” See Sen and Smith (1995) for a survey and Cheng and Wall (2001) for a very recent discussion. 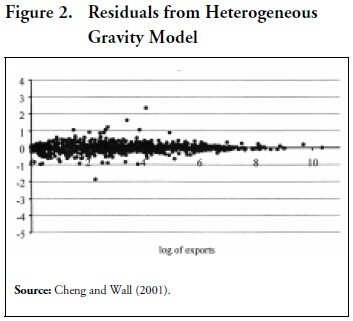 The gravity model simply states that trade relationships are determined to a large degree by the sizes of the trading partners and the distance between them. Specifically, the larger they are and the smaller that distance, the more trade there will be, all other factors being the same. A more sophisticated implementation of the gravity idea will recognize that it is not so much distance as the crow flies that matters, but some measure of the economic distance, so to speak. And there are other factors that affect trade relationships that need to be included, as well. For instance, we might want to include a variable to account for whether or not the trading partners speak the same language, as the USITC model does. 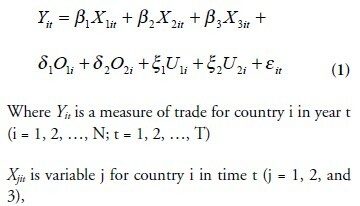 Where Y is a measure of foreign trade; GDP is gross domestic product; POP is population; ENGLISH is a dummy variable that takes the value 1 if the country is English speaking and 0 otherwise; COMM is a dummy that takes the value 1 if the country is a current or former communist country; DISTANCE is the great-circle distance between New York City and the country’s largest city; FREE is an economic freedom index; NAFTA is a dummy that equals 1 for Canada and Mexico; and FORBORN is the number of U.S. residents born in the respective country. The natural log is indicated by ln. The ßs are the coefficients to be estimated and ε is the error term. I do have four specific concerns with the USITC’s use of the gravity model: (1) their specification of the model is too simplistic, especially in regards to the distance factor; (2) I suspect that the estimates are biased due to the omission of certain important variables that may be correlated with variables that are included (so-called heterogeneity bias); (3) the conclusions of the study depend on an assumption that the characteristics of the Cuban economy, such as GDP, are exogenous to the model, an assumption that I do not find very believable; and (4) it is dangerous to use estimates to make predictions for a country not included in the sample, especially for one that is so unlike those that are included. I offer some suggestions in the following sections on how the study might have been done differently. However, there is no perfect methodology, and I believe that the USITC group has made an excellent start of estimating the impact of the embargo. However this is done in the future, I would recommend the use of sensitivity analysis to explore the impacts of the different assumptions and judgements that must inevitably be made. Why is DISTANCE the distance between New York City and the major city in the trading partner? Is all trade with all countries conducted through New York? Much of U.S. trade with Europe may be, but is trade with Mexico? What about Asia? I suspect that for Mexico and Asia, the distance measure may be off by a whole continent. Would Cuba’s trade be with New York or Miami? This has to be biasing the results. The geographic center of the U.S. might make more sense (except for Europe), but even this would be unsatisfactory, for it is not geographic distance that matters but some measure of economic distance. Los Angeles is 1,300 kilometers further from Tokyo than is Moscow, but the economic distance is surely much closer. The model needs more than just one geographic measure of distance. It does have a variable indicating whether the country is contiguous with the United States (NAFTA does double-duty in this regard), but the length of that continuity matters, I would think. Canada, our top trading partner, has a very long border with us, a border that literally stretches from the extreme east to the extreme west of the continental United States. Mexico’s border is long, but not that long. Further, Canada’s population is almost all very near that border, while Mexico’s is not. Distribute Canada’s population away from its border, and trading relationships would be very different, since much of the current trade is Canadians crossing the border to shop. This is just one (albeit an important) example of geographic effects not accounted for in the model. It might also be important to account for a country’s access to seaports. Would Bolivia’s trade with the United States be greater if it were not landlocked? Table 1, which I have taken from Wall (2000), illustrates the importance of accounting for effects other than distance. 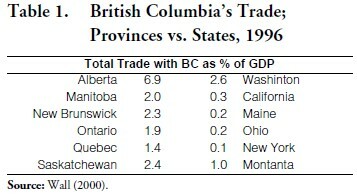 It indicates trade between British Columbia and other Canadian provinces compared to U.S. states of comparable distance. In most cases, trade with Canadian provinces is greater than trade with comparable states by a whole order of magnitude, surely a much greater effect than would be accounted for by the fairly minor inconveniences of crossing the border between these two NAFTA partners. If U.S. trading partners are heterogeneous in ways not accounted for in the model, and if that heterogeneity is somehow related to the variables that are included in the regression, then the resulting estimates will be biased. 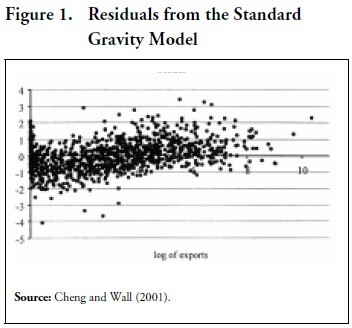 This is exactly what Wall (2000) and Cheng and Wall (2001) find for a gravity model very similar to the one used here. Cheng and Wall, for instance, estimate a gravity model for bilateral trade between all countries listed in the World Bank’s World Development Reports (not just between the United States and its trading partners). The bias that resulted can easily be seen in Figure 1, which plots the residuals of the regression against exports. This is not a well-behaved regression. The preponderance of negative residuals at low levels of trade and positive residuals at high levels of trade reveals that the regression is underestimating trade when actual trade is high and overestimating trade when actual trade is low. I suspect that a plot of the residuals from the USITC estimations would reveal a similar pattern. Assuming this heterogeneity takes the form of characteristics that are unique to each country and that do not vary over at least a short period of time, then it is possible to account for these fixed characteristics (usually referred to as fixed effects in the lingo of econometrics), and thereby eliminate the estimation bias, through the use of panel-data methods. A panel is a set of cross-sectional observations over two or more time periods. ε is the error term, and the ß, δ, and ξ are the coefficients to be estimated. Note that here I am arbitrarily assuming three observed variables that vary over time and place (GDP, for example), two observed fixed effects (DISTANCE, say), and two unobserved fixed effects. How to account for the time-series information? One way would be to simply take averages over all time periods (in econometrics lingo, the “between” estimator). Notice that the simple cross-section, as in the USITC model, is a between estimator for the trivial case of only one time period. The problem with the between estimator is the two (or however many there really are) variables that cannot be observed (the U variables). If the U variables are uncorrelated with the included variables, the only cost of having to leave them out is that their effects are taken up by the error term. That is, the omitted variables make our predictions on trade less precise. However, if the omitted variables are correlated with any of the included variables, the result is that the prediction becomes biased and inconsistent, as well as less precise. This is the situation that Cheng and Wall found and is depicted in Figure 1.
where the bar over each variable means that the variables in the regression are the difference between the means of each variable and the actual value for that year. This is called the within estimator. Since the deviation from the mean of a fixed effect is zero, all fixed effects, whether observed or not, drop out of the equation and the potential for heterogeneity bias is eliminated. Cheng and Wall transformed their trade data in a similar manner.1 A plot of the resulting residuals is shown in Figure 2. Notice how much less scattered the points (indicating deviation of predicted trade from actual trade) are and that the best-fit line between them is more or less the horizontal line at the origin. Thus, a within transformation of the Cheng and Wall data successfully eliminates the bias. Since the USITC data are similar and the estimation is based on a similar gravity model, there is every reason to believe that the USITC results are affected by heterogeneity bias and that panel-data methods can be used to eliminate the bias. In applying the results of the gravity model to make inferences about potential U.S.-Cuba trade, the USITC group assumes complete exogeneity of Cuban characteristics. This is an extreme assumption. At the moment that sanctions are lifted, of course, conditions will be unchanged, but so will trade with the United States. The study assumes a sufficient time after the lifting of sanctions to allow for a reaction in Cuba and the United States to the new rules of the game. And in that time, the freeing of trade with Cuba will give a boost to the Cuban economy. That is, both GDP and GDP/POP will rise, thus increasing trade. To estimate by how much GDP and GDP/POP will rise would require a major research undertaking that would probably not be worth the effort. However, the study would have benefited from a sensitivity analysis that would have allowed the group to explore the outcomes from different assumptions concerning the impact of freeing trade on the Cuban economy. Similarly, the USITC group assumes complete exogeneity of total Cuban trade. All that the group permits is a reallocation of trade with Cuba’s trading partners to include its new partner, the United States. Again, this is a very extreme assumption. Not only would lifting the embargo reduce the costs of trading with the United States, it would also reduce the costs of trading with all its other trading partners. There are all sorts of ways that the embargo increases the costs of other countries’ trade with Cuba. Ships that stop at a Cuban port cannot stop at a United States port for six months, for instance. A firm that makes use of former U.S. property in Cuba takes the risk of being sanctioned in various ways under Helms-Burton. In general, reductions in trade barriers result in more trade. It is true, of course, that Cuba erects barriers to trade and that it would continue to do so. Nevertheless, the assumption that there would be no additional trade seems extreme and, again, suggests the need for a sensitivity analysis. The study makes inferences about Cuba’s trade behavior based on the behavior seen in a sample of countries that does not include Cuba. This sort of out-of-sample prediction is reasonable when it can be argued that the country is similar in all important respects to the countries in the sample. But no such argument can be made here. Cuba is unique. It is unique in ways not accounted for in the gravity model and not represented in the sample. There is no way to tell how inaccurate the prediction is because of this so, once again, a sensitivity analysis would be very useful. The USITC report is based on an implementation of the gravity model, a very standard methodology to explain trade relationships. There are problems with this methodology, especially as implemented in the report. But there will always be problems with the very messy world of the social sciences, especially when dealing with such a difficult case as Cuba. I do think that the USITC group could have explored the issue of heterogeneity bias. Also, they could have used the results of the gravity model as a basis to conduct a very interesting and useful sensitivity analysis. Perhaps these are the next steps that can be taken by others. Cheng, I-H., and H. J. Wall (2001), “Controlling for Heterogeneity in Gravity Models of Trade.” Federal Reserve Bank of St. Louis Working Paper 99-010B. Eichengreen, B., and D. A. Irwin (1998), “The Role of History in Bilateral Trade Flows,” in J. A. Frankel, ed., The Regionalization of the World Economy, University of Chicago Press. Sen, A. and T. E. Smith (1995), Gravity Models of Spatial Interaction Behavior, Springer-Verlag. Wall, H. J. (2000), “Gravity Model Specification and the Effects of the Canada-U.S. Border.” Federal Reserve Bank of St. Louis Working Paper 2000-024A.